It’s 5 in the morning, President Trump of La-La Land (as usual, in his euphoric dreamlike mental state, detached from the harsher realities of life) was sitting on his gold toilet bowl, TWEETING. He did everything to salvage that. He signed executive order after executive order. He lashed out to everyone, especially the enemy of the people. He fired and abandoned his comrades-in-arm. He even re-enacted his campaign style mass agitation. No luck. While still sitting on the bowl, pondering, an inspiration suddenly dawned on him. Look at the past few months, almost every weekend, there were some kind of award ceremony, celebrating all different kind of entertainment celebrities and high achievers. Why not also an awards ceremony to celebrate the President, our savior, who is going to make America great again (and in the mean time, generating great fear and nervousness). And can have our own Red Envelope Awards Ceremony. We will call it the O’Scare Awards. This entry was posted in TRCG. Bookmark the permalink. 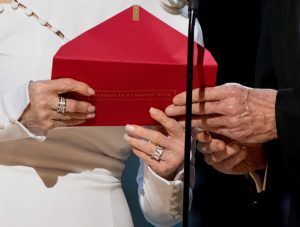 Why red envelope and not white envelope? In administration red signifies deficit or “you are fired”. In Chinese custom, red pocket/envelope is money in your pocket.